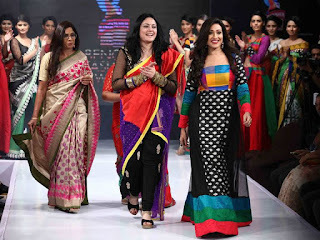 Aritra Singha ● Kolkata: Celebrated designers Jattinn Kochhar and Manoviraj Khosla, rolled out new textured wears at the KF Ultra Bengal Fashion Week 2 that recently concluded in the city. Kochhar’s signature Run Away creations, introduced here for the first time, were mostly in black and grey shades that earned applause of the audience and the fashion aficionados present at the event. He draped his leading model with a retro-feel Tulip gown to prove that today’s fashion savvy generation is open to experiment. “I have brought the Run Away creation for the fashion savvy Kolkata audience. These are very classy with predominantly black and grey shades with a hint of silver. These are very Zen colours,” he told WPC on the sidelines of the event. His forte was new fabrics in bright colours, from orange to gold, in single drapes in the show themed ‘Life’. “Fashion talks about celebrating life and having fun. Every time I am here I see how the style conscious people in Kolkata are evolving. It is only that we need more such occasions to party,” Khosla said. His showstopper was actor Sonnalli Seygall. On the inaugural day on September 11, Sharbari Dutta rolled out her men’s creations that included kurtas, sherwanis, Nehru jackets and the bandhgala range, drawing from ancient literature. Agnimitra Paul recreated the golden muslin era of Bengal in muted colours. Actor Shraddha Das was the showstopper for Dutta's creations at the concluding show. Sashi Panja, the junior minister in charge of the social welfare department of the West Bengal government, also walked the ramp.